This Performance Hybrid Nylon Whip was made for Sigrid with the standard color options in Gold, Dark Brown (Walnut), and Chocolate Brown with a black handle base. This Performance Hybrid Nylon Whip was made for Caleb with the standard color options and in Chocolate Brown and Midnight Blue. 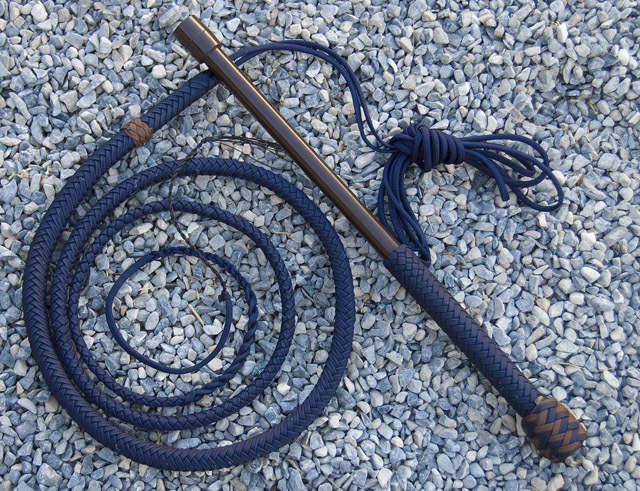 The plastic handle bases for the PH Whips are now also available in dark brown, as shown on this whip. This Performance Hybrid Nylon Whip was made with a red handle base, imperial red accents, and chocolate base braiding for the thong and handle. Check out our MidWestWhips Nylon Whips page for more information on Performance Hybrid whips.